Tour kick off in Brooklyn August 27th! We’re starting our road trip in a big way! 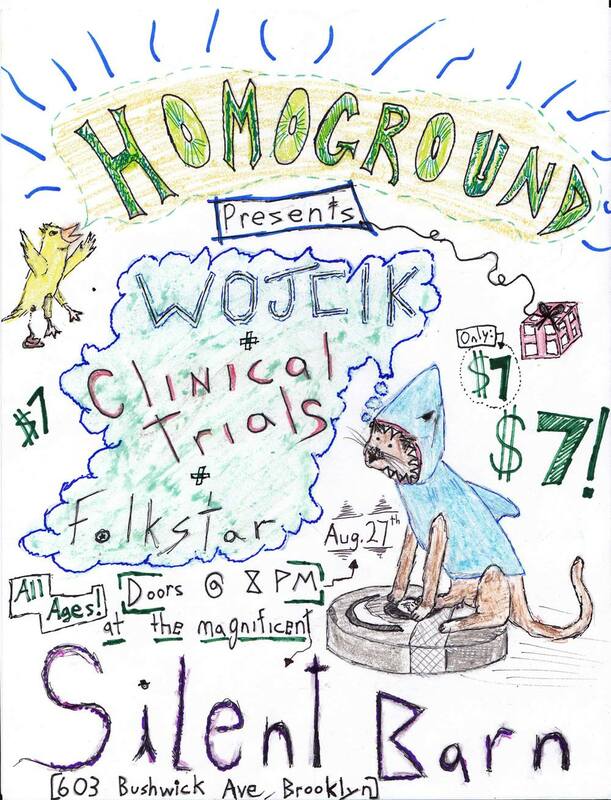 Homoground is putting on a show at the Silent Barn in Brooklyn, NY on August 27th and we’ll be playing some jams, along with Wojcik and Clinical Trials. Check out the event on Facebook. 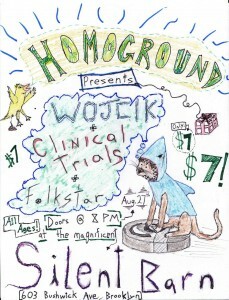 And look, someone made a lovingly drawn flyer! Starting next week, we are going to play a smattering of shows and house concerts, crash some open mics, and make up songs about people we don’t know as they walk by and hope they don’t notice (but kind of hope they do). If you’d like us to play at your house or bar, contact us and we may just stop by! The Socially Awkward Tour 2013 is on! Come for the music, stay for the awkward stage banter. See you soon, East Coasters! ← Loud and Clear has been released!! !